Why would parents place a newborn on her stomach to sleep, even though their pediatrician clearly advised against this position due to the increased risk of SIDS? Simple: many babies fall asleep faster and stay deeply asleep this way. Many, many babies struggle to fall asleep easily or stay asleep when they sleep on their backs. This leaves parents torn between safety and sanity. It does not have to be this way! Parents have good reasons to be afraid of SIDS; the death of an infant is an almost unimaginable tragedy. One of my best friends said that she could imagine surviving the death of her husband but she couldn’t imagine the pain of losing one of her children. Back sleeping is one of the simple recommendations to lower the risk of SIDS that has a proven record of efficacy. Simply put: placing your baby on her back to sleep could save her life. One reason that babies sleep so well on their stomachs is that it positions them so that the Moro reflex isn’t triggered when they move their head or limbs. It also gives them a lot of nice soothing deep pressure as the weight of their body is pulled by gravity into the firm bassinet mattress. This is also the reason it isn’t safe. This position makes it harder for a tiny baby in that deeper newborn sleep to clear her airway to breathe, since she doesn’t have the strength to turn her head while barely awake that older babies have. Getting a newborn to sleep isn’t easy, but it is made so much easier with The Happiest Baby on the Block techniques. I am a certified HBOTB educator, and I find the greatest error parents have made when they call me for a consultation is that they haven’t layered all the techniques. They bought a swaddle blanket or garment, they have a white noise playlist on their iPhone, and they got a swing as a baby shower gift. They use a pacifier, and they know about calming in side lying. Then they behave as if they are ordering appetizers at Cheesecake Factory: they pick the strategies that they think will be good tonight. Very young or very fussy babies just don’t sleep as well if you don’t give them all of the 5 S’s. The sequence is solidly based on the unique neurology and biology of newborns, and you ignore the details at your peril. Each component gives some support for calming a baby, but most babies need more than one, and most of the consultations I have done are for very fussy babies that clearly needed all 5 right from the start. Find a consultant if you just cannot get the swaddling or the jiggle down, and practice, practice, practice. Buy a swaddle garment if you are all thumbs with the origami-like blanket swaddle. But don’t think that since it works “a little” with just a garment and a pacifier, you are going to get the long, deep sleep that all 5 techniques together can allow. Always use the side lying or stomach position to calm your baby, but not to sleep. Don’t cave and put her on her stomach, thinking that most likely nothing will happen. You do not have to make that kind of gamble with your baby’s life just to get a good night’s sleep! This entry was posted in child safety, infant sleep strategies, newborns, parenting and tagged Happiest Baby on the Block and SIDS, SIDS and sleeping postions on April 19, 2015 by Tranquil Babies. 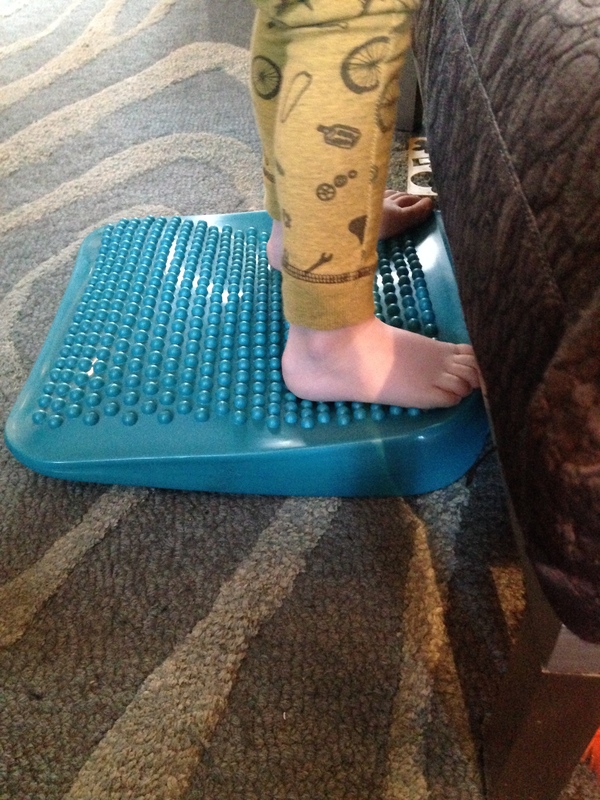 The trusty Move n’ Sit cushion that a generation of kids with sensory seeking or postural instability issues have used on their chairs can also be a great upright surface for toddlers with the same issues! Here is a two year-old client on his favorite piece of equipment. He calls it his “bumpies”, and loves the textured surface since he is a major sensory seeker who isn’t always aware of a less intense floor surface under his feet. The incline as arranged above is tilting him backward, but you can turn it over for a smoother side, and rotate it to shift him forward. It is easy to clean, lightweight, and incredibly durable. Mine is over 5 years old and going strong! This entry was posted in occupational therapy, sensory processing issues, toy/equipment review and tagged move n' sit cushion, toddler therapy equipment on April 19, 2015 by Tranquil Babies. When Your Preschooler Ignores You, Should You React? Sometimes you could swear that your 4 year-old is either deaf or unable to understand your simple directions. Repeating his name 5 times and getting no response would suggest that something is wrong. Some magazines would even suggest that this is a sign of autism or an auditory processing disorder. While that can happen, the overall percentage of children for whom that is an accurate diagnosis is small. Most children are actually very good at hearing and understanding you. They just don’t always respond. Watch him at school if you can. Does he ignore directions from a teacher? Does he respond to other adults in his life more consistently or more quickly? If that is so, then your child has developed a habit of ignoring you. Here is a suggestion: try saying nothing to get your point across. Even better, try doing nothing, no walking closer to him, no starting to help him follow the directions, nothing. This strategy works best when your direction or comment has a component that is inherently valuable to him. For example, ” Please pick up your toys” isn’t inspiring, there isn’t anything there that would make a child want to respond. “It is snack time. What snack would you like?” should inspire a response, but often your child is involved in something else that is a higher priority to him at the moment. He assumes that you will work harder to get his attention if you really care about him giving you an answer. Try making it important to him to communicate with you instead. Go ahead and make something for yourself, or don’t move toward the snack cabinet. Do nothing, say nothing until you get a response. This isn’t about turning the tables on him in a punishing manner, nor is it letting him feel you being “rude” to him. It is a way to help him learn how to interact to you effectively. More traditional parenting emphasized the concept that could be best described as “speak when you are spoken to”. Today’s more relaxed parenting style has fewer rigid rules about manners, but it can be maddening when you find yourself begging for an answer from a young child. It is possible to make it clear that replying to you is how he can best get what he wants. And it is worth considering that you could also instruct a child that he is behaving like a grown-up when he speaks to you when he is spoken to. This entry was posted in behavior issues, parenting, toddlers and tagged preschool listening skills on April 19, 2015 by Tranquil Babies. I support safe baby wearing for bonding and stimulation of infants. But what happens when older babies and toddlers scream when you put them down? You can’t cook at a stove safely (I guess you could wear them on your back, but little legs still kick forward near a flame), drive a car, or change a diaper. Or do the many, many other things that need to get done. When an older baby or toddler demands to be held all the time, in the face of fun to be had in other places, everybody is upset. The child first of all, but also the parent who doesn’t want to show rejection but doesn’t wish to or safely cannot hold the child for extended periods. The issue usually isn’t too much attachment or even too little quality time. It is that both party’s communication skills aren’t working well. Children old enough to crawl and walk may still crave being held other than when they are ill or tired. Who is to say that isn’t a good thing? But frequently the child that demands to be held isn’t calm once they are picked up; I have seen them immediately go into an aggressive mode, pulling hair or hitting the parent holding them. Seeing this pattern in their request to be picked up should be the big, big clue here. These children are asking for a parent’s undivided attention and choose this method to get it. Here are two strategies to support skill development while also being loving and respectful to your child. The Happiest Toddler on the Block has a technique called “Patience Stretching” that I really like. The child wants something that you can and will give him, such as a snack. It could be a bottle if the child isn’t absolutely famished. It could be a toy, even your phone. You use the Fast Food Rule to communicate that you understand their request, and agree to it smiling the whole time. You start to fulfill the request, then using some dramatic flair, say something like “Oh, wait, Mommy just has to go do _________ and I will be right back to [fulfill the request].” You disappear for about 3 seconds, you can even talk to them from around the corner, saying you will be right there, then come back and deliver the goods with a smile. Some younger children or very spirited children may cry, but some don’t even have the time to do so. The next request gets a slightly longer pause, and it repeated until you have a minute or a few minutes between agreement to fulfill the request and the delivery. Building patience this way is very kind, develops trust, and is so helpful to busy families that always have to take care of 3 things at once. Strategy Number Two: if your child is the kind who gets picked up only to squirm to get down in 30 seconds, you have someone with a habit of attention-getting that is going in the wrong direction. Try getting down on their level and doing something physical, such as playing patty-cake or holding their hands and swinging. Then redirect them to a favorite toy for independent play. Your child may not be able to start some independent play without a little help. Playing alone is a skill that is learned, not a developmental stage. It is very important to develop that ability, as it supports creativity and exploration of the environment. Strong independent play skills can also prevent the “I’m bored” stage later on. Resist the temptation to say something like “I won’t pick you up but we can play” because your actions are saying that without using words. This entry was posted in behavior issues, parenting, toddlers and tagged patience stretching, when babies won't let you put them down on April 12, 2015 by Tranquil Babies.